Let's take a trip back to the heady days of early summer. I had just made aliyah two weeks prior, and I was floating on a cloud of fresh Zionism, blessedly uncomplicated bureaucracy and warm Jerusalem breezes. I had just started ulpan, and sub-par accommodations and undesirable food notwithstanding, life seemed simple and fun. I was at the beginning of five months of Hebrew lessons, dorm living and getting myself situated here in Israel. I initially signed up to do this specific ulpan to give myself a "soft landing." My housing, food, social and scheduling situations would be taken care of until mid-December. I was golden. Except now it's December! Five long months have passed in the blink of and eye, and in less than two weeks, my adult life in Israel will truly begin. Sure, I had lots of stuff to take care of these past 5 months. But in short order, I find myself scrambling to find: an apartment, a job, furniture, a driver's license, a social circle, and all the details each of these involve. Let's break them down, shall we? On December 15, I will be homeless. I will leave the (not terrible) confines of my dorm room and have to live in a place of my own. Luckily, after much searching (blog post forthcoming), I have found a place to hang my hat, and I think I love it. Problem is, it is currently an empty box. A cute and well-located box, but empty nonetheless. It needs furniture, and furniture costs money. Which I don't really have, because I haven't worked since June (!!!) This results in a battle of wills deep within. On the one side, we have the newly thrifty Jordana, trying to get the best deal and buy the bare minimum of household essentials. On the other, prettier, side, we have the Jordana who loves to decorate and beautify, and wants vases, sconces and chandeliers! I am trying to marry the two sides and decorate my apartment efficiently and adorably. This is much more difficult when the closest Target is 5,000 miles away. Check out this piece of second-hand beauty! Another source of stress is converting my license from American to Israeli. Unfortunately, this does not involve learning to honk louder and curse in Hebrew. It is a truly involved process which takes copious amounts of time, energy, and money! I could write a whole blog post on just this topic, but in a nutshell: First you take an eye test (money) where they give you a green paper, which you need to have signed after a doctor's check-up (money). 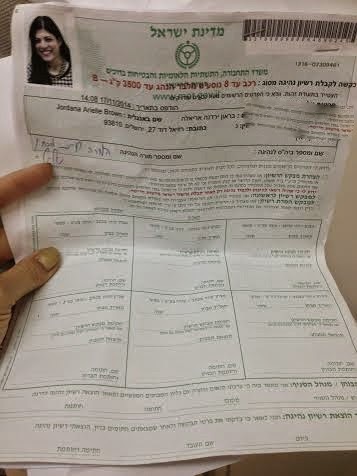 Then you take these papers and your license to the Jerusalem DMV (money) where they hassle you for 3 hours because your NYS license was issued after your aliya and how can this be? Then they reject your valid explanation and make you contact the DMV in Jamaica, Queens in order to sort it all out. Then you need to schedule at least one driving lesson (although the instructor will recommend two- money) and then soon after you will take your test (lots of money) possibly more than once, if the fates are not on your side (even more money!) Then, you can pick up your temporary license (money) before being sent your permanent one (dare I say it...free?) And that is how you convert an American license. And why must you do this now, when you have your whole life in Israel to drive and no access to a car in the foreseeable future? Because the state of Israel gives you a one- year grace period, and after that time you must begin the entire process as an Israeli, with thirty hours of lessons and a written test! No thanks, man! My last source of angst in the whole "finding a social circle" issue once I leave ulpan. Much as I like to gripe about this place, there is comfort in knowing that there is always someone downstairs to talk to, always a group to go out with at night, and always a birthday to celebrate. Once we leave the confines of ulpan, we will be scattered to the wind, with many of my favorite people here making the big move to Tel Aviv. I know it's not that far geographically, but logistically, it's a trek. Then there is that dual dilemma of my living alone and also choosing to not live in Katamon. I want to live alone precisely because I like to be with people. Sounds weird? What I mean is, I want to be able to host out- of- town friends, shabbat dinners and small gatherings without worrying about bothering a roommate. I want to be able to be a crash pad for friends and relatives visiting the center of town. Living alone affords me all this, but it also threatens to isolate me. So does living in the center of town. Most young, Orthodox singles in Jerusalem live in the "Katamon" area, which is actually several connected neighborhoods about a twenty minute walk from town. The vast majority of ulpan-ers are choosing to live here, many with other people from ulpan. They are basically transporting a piece of the "ulpan bubble" to their post-ulpan lives. So they will very likely be socializing together and I will very likely need to work harder to maintain connections. This, too, is a stress, even for an uber-social person like myself. So now that I've outlined what I'm stressing about, I actually feel much better. Sometimes it help to talk (type) it out, put it all out there, and tackle it one step at a time. I have an apartment and some stuff with which to fill it. I will find some job at some point I'm sure (maybe Cofix is hiring!) and I will get a license after x number of tries, please G-d. And I already have some great friends, so worse comes to worst, I will just stick with them if I never become the toast of Katamon society. I'll be just fine, don't worry. And while you're at it, tell my mom not to worry either!